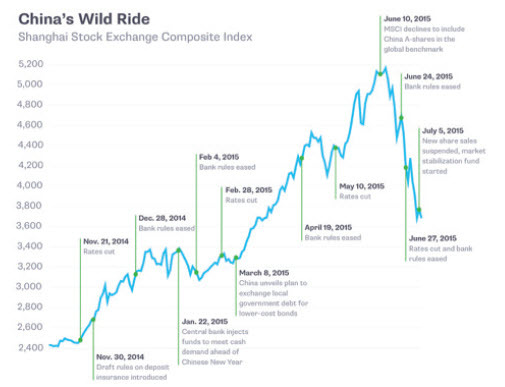 Earlier this summer, China’s stock market appeared to be in free-fall, despite the Chinese government’s efforts to control stock prices and stem the panic. The chief culprit appears to be leverage: investors last year and in the first half of this year borrowed billions in order to buy stocks on margin, offering little or no collateral except the shares themselves. As prices fall and stock values drop below the level of debt, it triggers margin calls from the lenders, which forces investors to sell at any price, further depressing prices, causing more margin calls in a downward spiral whose bottom is not easy to see from here. A recent report said that the volume of these margin loans dropped by 6%, or $23 billion over five trading days, which implies that there is still $383 billion more that could be called over the next months or years, an alarming 9% of the roughly $4 trillion in total market value on the Shanghai market. But leverage is only part of the problem. The CSI Information Technology Index, a mix of high-tech names in China similar to the NASDAQ in the U.S., is still trading at a multiple of around 75 times earnings (PE), while NASDAQ’s PE is closer to 30. If the two indices were to normalize, it would imply that Chinese stocks could drop an additional 60% in value before the current bear market has run its course—and that’s assuming the debt situation doesn’t cause the market to overshoot on the downside. Some compare the situation in China to the dot-com bust in the year 2000. One complication in the situation is the fact that, since late last year, foreign investors have been allowed to invest directly in Shanghai-listed stocks. Savvy market traders with years of experience in these death spiral events have been making program trades which bet on further drops. Chinese regulators recently suspended 34 U.S.-based hedge fund accounts from trading, including the Citadel Fund, and short selling is now totally forbidden. Arrests for selling stocks short have been reported. This past week, investors across the globe were sent into a panic when the Chinese Central Bank devalued the nation’s currency, the yuan. The U.S. market temporarily lost more than 1% of its total value, oil prices fell, and global shares plummeted on news that China decided to make its currency two percent cheaper than it was before. Despite the Central Bank’s assertion that it was a one-and-done devaluation, they proceeded to further devalue the yuan two more times within a matter of days. You actually read that right. Headlines raised the prospect of a global currency war, and there were hints in the press that nations might resort to trade barriers, which would slow down global trade in all directions. If you’re following the story, you probably didn’t read that the Chinese yuan, even after the devaluation, was actually more valuable against global currencies than it was a year ago in trade-weighted terms. Nor did you read that China actually intervened in the global markets to make sure the devaluation didn’t go any further in open market trading. The background for the devaluation is China’s slowing economic growth and its recent stock market volatility. The Caixin China Manufacturing Purchasing Manager’s Index recently fell to levels which indicate economic contraction, and industrial output is at the weakest level since November of 2011. If you can believe the numbers, the country is on track for a 7% growth rate this year—three times the U.S. rate, but sluggish by recent Chinese standards, and quite possibly unacceptable to the country’s leaders. You probably already know that the Chinese stock market climbed to impossibly high levels earlier this year and then fell just as far in a matter of weeks. As you can see from the below chart (and as mentioned above), the Chinese government marched into the chaos with a heavy hand, outlawing short sales, banishing hedge funds to the sidelines, suspending margin calls and even buying stocks directly in an effort to put a floor on prices. The theory was that the devaluation was part of this intervention, since it would make exports cheaper and boost sales, raising profit margins of those companies whose stocks were recently free-falling. Some believe that the Chinese won’t quit until they devalue the yuan by at least 10%. A more nuanced view of the situation is that the recent depreciation is a small step to keep the yuan’s value in line with those of its peers, not a dramatic shift in exchange-rate policy or a part of the Great Shanghai Market Panic. Indeed, if you look at the below chart, you can see that China’s percentage of world exports has been steadily growing for this entire century, without any need to add the stimulus of a weaker currency. A scarier scenario, which nobody seems to be talking about, is that China’s endgame goal is to make the yuan the reserve currency for global trade—replacing the U.S. dollar. China is already lobbying to join the list of reserve currencies recognized by the International Monetary Fund. The new exchange rate is more in line with basic economic fundamentals, strengthening the argument that the yuan is not under the total control of an interventionist central government. But so long as China imposes strict limits on the amount of its currency that can flow into and out of the country, and attempting to manipulate its own stock market, this will be a difficult argument to make. You don’t often see a market rally when an economy is sliding into recession, so at these valuations, you aren’t likely to find many bulls left in the Shanghai China shop either.